For those of us who can remember, the late 1960’s was a time of massive change and excitement. The revolution was in progress and we were Feeling Groovy. There was no capacity for bland in music, fashion or the people. 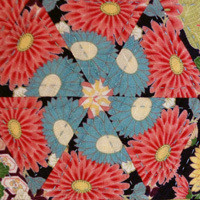 The hippy movement flourished and flower power burst into our lives. The new fabrics were bold, colourful and loud. The rule of the day was anything goes – fabulous was in! In those days, as a wannabe-groovy teenager, I was totally enthralled by the vibrancy and freedom of this bright new world. 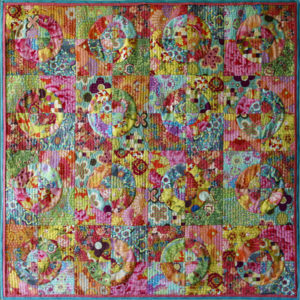 Now, as an older-but-totally-groovy quilter, my passion for these vibrant, busy fabrics is evident in the Feeling Groovy Quilt. Once again, I found myself madly purchasing fabrics with absolutely no idea of how I would use them. What I did know was how I felt, as they flew me on a magic carpet ride of memories, straight back to groovier times. I just wanted to capture those heady days. 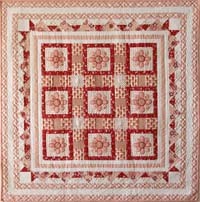 The combination of so many busy fabrics meant that the quilt design needed to be kept simple. 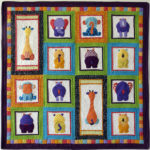 A good place to start, when designing quilts like this, is to have one interesting block that is repeated throughout. 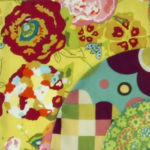 This will give the quilt a basic structure and uniformity that can carry such a wide variety of fabrics. 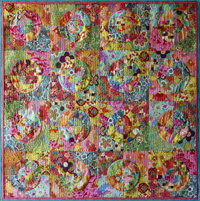 The curved blocks in this quilt were ideal and fitted the groovy theme to perfection. 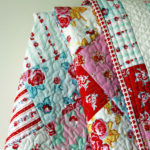 Many people are daunted by curved piecing, and yet, it is surprisingly easy. Yes, it is more fiddly than sewing a straight seam, but it is achievable. 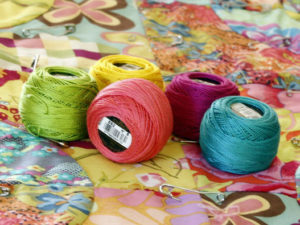 It doesn’t matter if you sew your blocks by hand or by machine, the following tips will guide you. 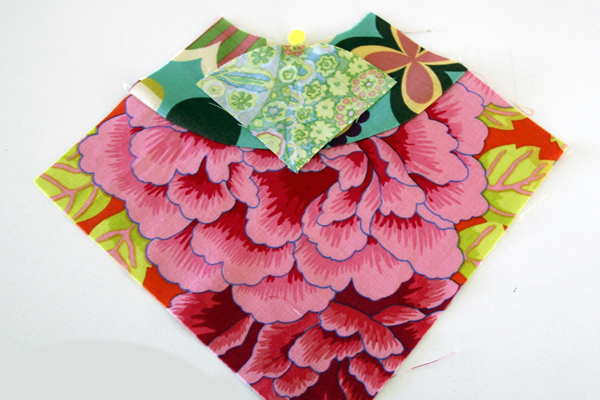 Fold pieces in half to find their centres. Pin the centres together. Making sure the curved edges are lined up, pin the ends. Then pin the remaining curve. 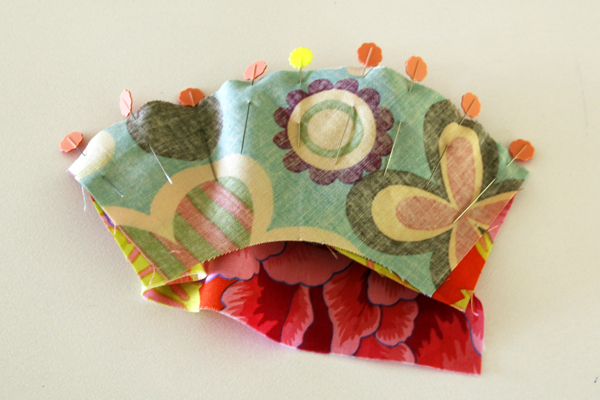 Using a 1/4-inch seam, stitch the pieces together. 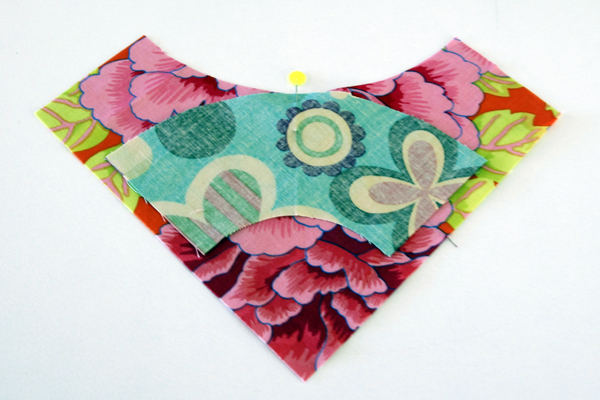 Ease the fabric as you sew to ensure there are no puckers. As with anything new, take your time. The technique will get easier with practice. I know you can master this – I have faith in you. Bring back the swinging sixties by making your own Feeling Groovy Quilt. The pattern is ready to download and print. It includes fabric requirements, detailed instructions and the block templates for tracing. Give curved piecing a try. I know you will love it. Until next time – Be Groovy! 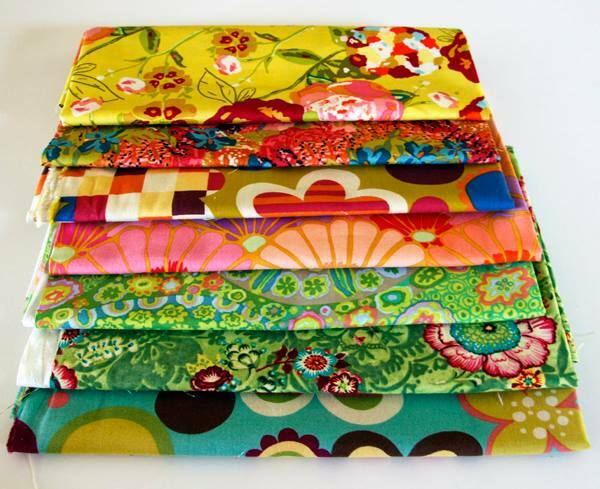 These fabrics remind me of the dresses I sewed in Home Economics in the sixties – back when we actually made our own clothes! They made me feel carefree and cheerful. I want to wear this quilt, Helen Draper. Back when we were foot loose, fancy free and beautiful dressed Kimberly.